I don’t think I have ever said to a client that their house is ugly. Partially because I have never found a house so ugly that it cannot be improved. More so because what attracts us to a house is personal and what may appear ugly to me, for someone else might be amazing. 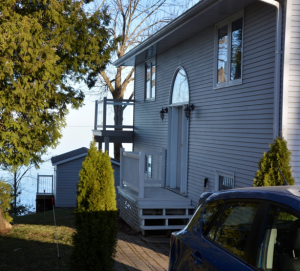 This house has an amazing view, sits on an amazing hill and has an amazing yard on the lake side. However, it does lack in curb appeal on the road side. I think the client suggested that it’s a bit of an ugly duckling. We were hired to make a small addition to the side of the house for a new foyer/entrance and to improve the cottage interior layout. 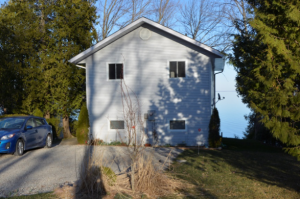 When we started to write out the entire scope of work for the cottage renovation, new siding, new roof and new windows were added so that everything was brought up to date and the client could enjoy the cottage without having to do any other work on it in the future. 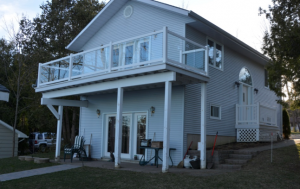 They also requested a car port, replace the deck and a screen porch. Our role for this project was to act as the “prime consultant”, which means we are in charge of following the whole process from start to finish. With the increase in the scope of work, it meant we would need to bring an architect on board to deal with the structural aspects of the renovations. There would also be changes to the septic system and we needed to go to the ‘COA’ (Committee of Adjustment) because the lot was narrow and the new addition on the side would encroach on the zoning set back for the property. These are all fairly routine issues and did not raise any concerns. However COA can be a challenging because any time we want to vary outside of the rules, there is a chance they could refuse our application. In this case, we were successful with our COA application and they liked the new design. More on that later. The biggest concern with doing an application to the COA is the time required. Making the application, getting a hearing and then waiting through the appeal period, it could add 2 months to the design and construction timing, which has to be factored. I think this is time worthwhile and there is really no way to speed up the process. Going through COA can cause issues if there is a deadline for getting the house finished and ready to use within a specific time frame as normally we don’t time budget for this work. Thankfully, in this case, we had some latitude in the construction time frame. Although none of us like to hear a project is going to take longer than planned. It also means that what we had scheduled as a spring start for construction gets delayed to a summer start, which means we are working through the winter on exterior parts of the construction. This presents challenges for cement work, getting heat in the building, putting masonry on the outside or just a cold and miserable crew who have to work in so many clothes they look like big round snowmen. Shortly, I will show you the options for the new design and discuss how we work at budgeting the costs.